New for 2019, our Guided Trail Runs are perfect for anyone keen to start trail running or progress from a 5k. 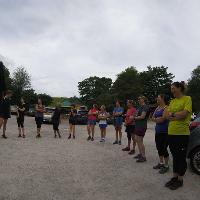 A Brockholes Guided Trail Run is perfect for anyone who's keen to start trail running or looking to progress from a 5k. It’s relaxed and easy going with a mix of walking up the hills, jogging and running and the distance is around 7.5km. Everyone will be guided along a well-planned route which takes in some of the best features of our nature reserve. The focus will be on having fun and enjoying the social group atmosphere. It's not a race and those who find the pace easy must be happy to accommodate any slower runners and to go no faster than the lead guide. The run will be led by the experienced and ever friendly 'Love Trail Running’ team. They've been guiding a range of abilities on their unique trail running events for years, so we're super happy they've agreed to get involved and guide our trail runs. 10:00 am Meet and greet in our Restaurant on our floating Visitor Village.You will need to complete a registration form on arrival and provide us with your car registration number. Running clothing appropriate for the weather conditions of the day. Trail shoes are advisable but not essential. Warm/dry clothes to change into. Tickets include free parking for the full day, a hot drink and the services and support of the Love Trail Running Team.